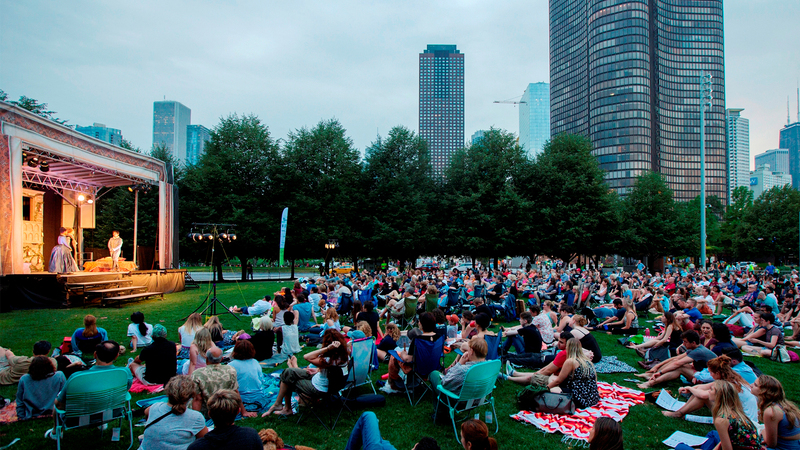 Chicagoans don’t just spend their summers sipping away in beer gardens or hitting up local street fests; they also head to parks and other public places around the city to take in movies, concerts, and theater performances. Their secret? 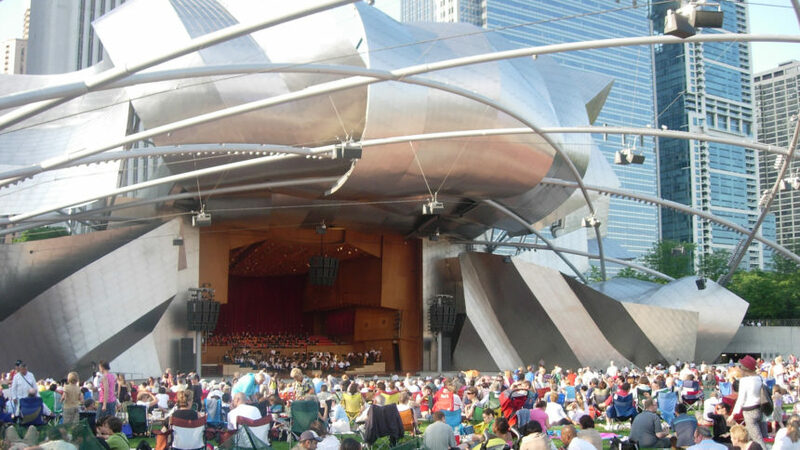 When the temperatures rise after a long winter, many of Chicago’s major cultural institutions take to the streets and put on free-of-charge al fresco performances. A site to see in and of itself, the stunning Frank Gehry-designed Jay Pritzker Pavilion located in Millennium Park transforms into the city’s cultural hub every summer. One glance at the skyline view from your perch on the lawn and you’ll understand why. The Millennium Park Summer Music Series, its marquee event, kicks off June 18th with a jazz-fueled tribute to Bill Withers (he’s the one behind the hits “Lean On Me” and “Ain’t No Sunshine”). This year’s line-up features 10 concerts from June through August, with something for every musical preference, including reggae, folk, indie rock, and salsa. This is also the spot to check out DJs and dance music at the Chicago House Music Festival on May 26th and free blues during the Chicago Blues Festival, which goes on from June 8 through 10. The stunning Frank Gehry-designed Jay Pritzker Pavilion located in Millennium Park transforms into the city’s cultural hub every summer. Spending a summer day at Wrigley Field is one of Chicago’s most beloved past times. But don’t think you need to go inside the ballpark just to have fun. Last year saw the opening of a new park outside the stadium called Gallagher Way (formerly known as The Park at Wrigley). And this year its calendar is packed with fun, free events including showings of silver screen favorites under the stars. Settle in with some popcorn for films like Grease and Back to the Future, as well as movies set in Chicago, such as Home Alone and The Fugitive. Also, keep an eye out for announcements about movies in other parks around the city, including in Lincoln Park at the Chicago History Museum, a 10-minute walk from The Ambassador. 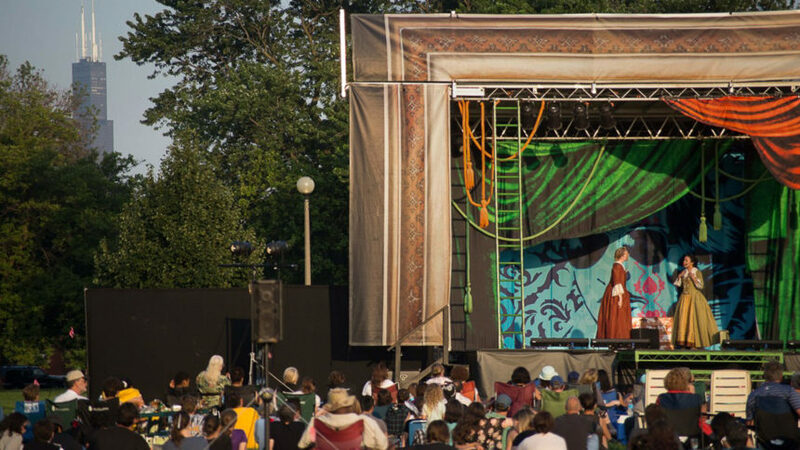 Embrace the best of The Bard while taking in some fresh air by seeing a production of Chicago Shakespeare in the Parks. Entering its seventh year, the show stages open-air productions in front of pop-up sets throughout the city, making performances accessible to every neighborhood starting in July. And don’t be deterred by the typical length of William Shakespeare’s plays – his prose gets condensed to a family-friendly 75 minutes. More into modern shows? On August 13th, theater fans can get a taste of the Great White Way during the Broadway in Chicago Summer Concert at Millennium Park. This year’s lineup includes professional performances from Tony darlings Dear Evan Hansen and Miss Saigon. The show stages open-air productions in front of pop-up sets throughout the city. *Featured photo by Chuck Osgood.